You can tell what issues are current in records management by the questions organisations pose to records management consultants. An organisation delivers projects in challenging environments around the world – areas of military conflict, political strife, economic turmoil and low internet bandwidth. They had developed a corporate records retention schedule. Project records were spread across several different business applications. They had an application to capture the formal project documents (Project initiation documents, Project close out report etc.). They had an application to capture the contractual documents arising from any procurement done within projects. Day-to-day e-mail correspondence arising from projects resided within individual e-mail accounts. Day-to-day documentation arising from projects resided in shared drives located in regional offices all around the world. None of those these applications had any place to hold retention rules. How could/should they apply the retention schedule that they had just received corporate sign off for? An organisation implemented an electronic document and records management system (EDRM), with a records classification (fileplan) and retention rules. Acceptance around the organisation was varied – some areas made little or no use of it but for others it was business crititcal. The IT department were pushing heavily to introduce SharePoint as a collaboration and document management tool. What should their records managers do? Should they reject SharePoint entirely? Should they implement SharePoint but integrate it with their existing EDRM? 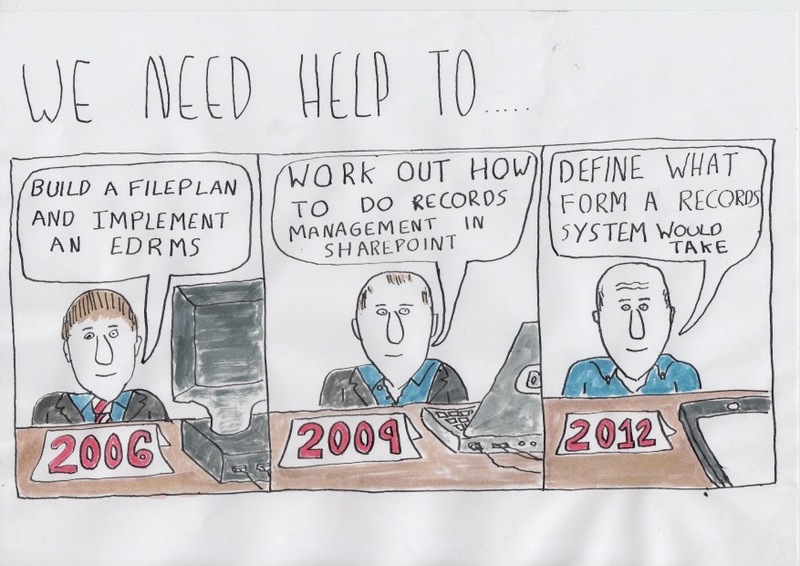 Or should they find a way to use SharePoint as their document and records management system, replacing the EDRM? For over a decade an organisation had done its records management within the Lotus Notes environment. They had customised the e-mail client so that it integrated with a records repository. They reached a point where they needed to upgrade the environment, but upgrading the customised e-mail client proved difficult so they switched to a standard Lotus Mail client, leaving them without e-mail integration to their records repository (also built in Lotus Notes). One issue was deciding on priorities – should they stay in the Lotus Notes environment and rebuild the link between e-mail and records repository? or should they move to the Microsoft environment (Exchange and SharePoint) and tackle the records problems then? An organisation implemented an EDRM integrated with the Microsoft Outlook e-mail client. The integration allowed end-users to use the key functionality of the EDRM from within Outlook. Without leaving their e-mail client they could create records folders within the EDRM, drag and drop e-mails into the EDRM, and search and consult records in the EDRM. How would it affect the EDRM if the organisation moved to cloud based e-mail with a standard e-mail client? These challenges are all different in their specifics, but fundamentally they reflect the situation that records managers find themselves in at this point in history. Records managers are attempting to create the capability to apply over-arching and timeless records management frameworks (organisation -wide records classifications/fileplans and retention rules) in a fragmented environment of multiple applications (e-mail clients, collaboration tools, line of business applications) in the shifting sands of changes in every aspect of organisational technology (the increased adoption of portable devices, the move to the cloud, the ongoing software update cycle). There is a fundamental tension within organisations between an organisation’s need to manage its IT and its need to manage its records. The IT imperative is to be agile. The organisation needs to keep upgrading applications, productivity tools and devices to keep up with the latest offerings from vendors, and the latest developments in technology and working practices. The IT nightmare is to be stuck on old versions of things. Stuck on Windows XP, stuck on Office 2003, SharePoint 2007, Internet Explorer 6. Stuck with applications that only run on desktop PCs when colleagues are trying to work from tablets and smartphones. Stuck with applications that only run on on-premise servers when the organisation wishes to move to the cloud. On the assumption that you are happy with the providers/vendors of your existing business applications, the best way to avoid being stuck is too keep customisations and integrations to a to a minimum. Customisations and integrations complicate and slow down upgrades, and would complicate any move to the cloud/adoption of new devices. The records management imperative is to apply frameworks and rules. Apply a records classification, apply a set of retention rules, lock down records so that they cannot be deleted unless in accordance with retention rules, Ensure that systems can export records and all of their metadata in a format that can be imported to successor applications. The clash between these imperatives comes because each organisation deploys many different applications. An individual in the course of a working day might use an e-mail application, a shared drive, SharePoint team site, a line of business application. Off the shelf none of these things has the functionality to apply those records management frameworks and rules. So we need to do something to those applications – we either need to customise them so they can manage their own records; buy plug-ins for them so they can manage their own records; connect then to a governance tool that can manage their records from the outside; or connect them to a records repository that can take their content from them (either immediately or at a later point in time). In other words the records management requires each application to be customsed/integrated/connected and/or extensively configured, and it is this need that creates the tension between the records management imperative and the IT imperative. There would not be any tension with between the IT imperative and records management imperative if records management could be done by a single stand-alone application. Lets imagine you installed an electronic records management repository, with a corporate records classification and retention rules, capable of protecting records from amendment and premature destruction. It might be an Electronic document and records management system (EDRMS) that complies with one of the specifications issued by nations/trading blocks such as the US DoD 5015.2 specfication. Or it might be a SharePoint records centre. If this was the case then all the other applications in the organisation would not matter to the records manager. The applications used to communicate, collaborate and get work done could be installed, upgraded, replaced, moved to the cloud etc. as and when required, without the records manager needing to ask for any customisation/ integration/connection or integration of those tools. However we know from experience that this is not the case. When an individual creates or receives a document/e-mail, they know that it stored safely enough in an application (whether that application is their e-mail account, their shared drive, a SharePoint team site, a line-of-business application or anything else) . They have no incentive (and possibly no time) to move it anywhere else. The force of gravity applies. To extract the documents/e-mails needed as records from these applications is going to require an investment of energy either by the end-user on a day-to-day basis, or on the part of the organisation in a one-off investment in customisation/integration/configuration/connection. The key feature of a records management system is not the functionality of the records repository itself, It is the link between the repository and the applications people use to do their work. For example the weakness of the records management model in the last two versions of SharePoint had nothing to do with the quality or otherwise of the records repository provided within SharePoint (the SharePoint records centre). It had everything to do with the difficulties organisations have had in defining and configuring the rules by which documents were routed from each particular document library in each SharePoint team site to an appropriate place in the SharePoint records centre, and the lack of out-of-the-box integration between SharePoint as a whole and e-mail. When you start talking about customising an application, or integrating it with other applications or extensively configuring it, then you are talking about a considerable amount of lapsed time. The time to make the customisations/integrations/configurations, put them into production, and for the changes to be used enough to yield benefits. ‘Yes but that will take a year to implement and in two years time we will be moving e-mail out to the cloud/moving to the next version of SharePoint /using smartphones and tablets for everything’ The customisation/configuration/integration you propose wouldn’t work with cloud e-mail/isn’t needed in the next version of SharePoint/ won’t be usable on tablets’. some had once had a workable records management relationship between their records repository and key applications such as e-mail but technological changes had disrupted the set up. some had not been able to set up any sort of records management system and either the pace of technological change or the large number of different applications involved was preventing them from getting started. The challenge for records managers then is not only ‘how do we set up a records system that works, and that ensures that content needed as records can be protected, organised and subject to retention rules’. The challenge is also ‘how do we set up the records system in such a way that as the business wishes to adopt applications/technologies it can, and these application/technologies can become part of the records system rather than sitting apart from it (and hence bypassing and undermining it)’. Stability and agility are like ying and yang- they look like the complete opposite of each other, but in reality they are dependent on each other, and each needs a bit of the other. The more frequently an organisation changes applications (the more agile it is) the more it needs it needs a stable records repository to maintain content from the many and various legacy applications that it has ceased using. There are essentially two different approaches we could take to managing records now we know that a stand-alone repository has limited use, that every organisation deploys multiple applications, and that the cloud era is going to make it more important to ensure that content and its metadata is not locked into on any one particular software-as-a-service application. You may be sitting in an organisation that does not currently have anything useable either as records governance tool or as a records repository. If you have dozens of different applications you may be wondering how you are going to connect them all to any future governance tool/ or records repository. You may be struggling to picture what such a governance tool/such a repository looks like, and what the connections would look like between your business applications and the governance tool and or the records repository.